In the three decades following the Civil War, relations between blacks and whites in the Catholic Church were as dramatically transformed as they were in the rest of the country. Emancipated Catholic slaves no longer had to rely on their former masters to support their religious faith. African-American Catholics, both free and former slaves, began to create a uniquely black Catholic organizational life. The condition of the newly freed African-American population did not go unrecognized by the members of the Catholic hierarchy, either in the United States nor in Rome. In 1866, Archbishop Martin J. Spalding of Baltimore called together the Second Plenary Council of the United States partially in response to the growing need among former slaves for religious care and ministry. One of the key issues discussed by the council was the establishment of separate "national" parishes for African-American Catholics, similar to those established by antebellum Irish and German Catholic immigrants. In addition, Spalding began lobbying for a national ordinary for African-American Catholics. Conceived as a special office to be filled by a bishop that would focus on black Catholic needs, the members of the American hierarchy rejected Spalding's national ordinary, claiming it would impinge on their authority within their respective dioceses. Along with the American clergy and hierarchy, a number of men's religious orders from Europe began sending missionaries to the United States. In December 1871, for example, four members of the Foreign Missionary Society of England (Mill Hill Fathers), an order whose original mission was to evangelize in Africa, arrived in Baltimore and took responsibility for St. Francis Xavier Parish. The priests soon broadened their mission, working among African Americans in Delaware, Kentucky, Maryland, South Carolina, Virginia, and the District of Columbia. 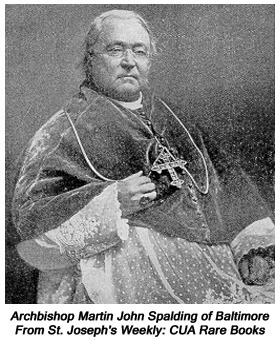 Under the leadership of the American Father John R. Slattery, the Mill Hill Fathers established Saint Joseph's Seminary. In 1891, Charles Randolph Uncles, trained at Saint Joseph's Seminary, became the first African-American priest ordained in the United States. The next year, Father Slattery received permission from Cardinal James Gibbons and Father Herbert Vaughan, the founder of the Mill Hill Fathers, to establish a separate order, Saint Joseph's Society of the Sacred Heart (Josephites). Over the next several decades, with growing racial segregation, the Josephites became embroiled in a controversy concerning a refusal to accept African-American candidates into their seminary on the grounds that these students lacked adequate training for seminary studies. For many African-American Catholics, the Josephites' decision bordered on blatant racism, further straining relations between the Josephites and certain sectors of the African-American Catholic community. While making some small, if hard-fought, gains in securing their own clergy, African-American laymen also campaigned for a coordinated national effort to shape church policy as it applied to black Catholics as well as to improve their educational opportunities. Under the leadership of Daniel Rudd, a former slave and publisher of the American Catholic Tribune, the first Black Catholic Congress convened in Washington, D.C. in 1889 to discuss issues ranging from African-American Catholic children, job training, and the promotion of "family virtues." Recognizing the importance of developing good relations with other Catholic ethnic groups, the members of the first congress resolved to express their "sympathies with our brethren of the Emerald Isle, who like ourselves, are struggling for justice at the hands of men," and to discuss with members of the German-American Catholic community the possibility of a general Catholic congress. Members of the African-American laity met again in Cincinnati, Ohio (1890), Philadelphia, Pennsylvania (1892), Chicago, Illinois (1893), and Baltimore, Maryland (1894).